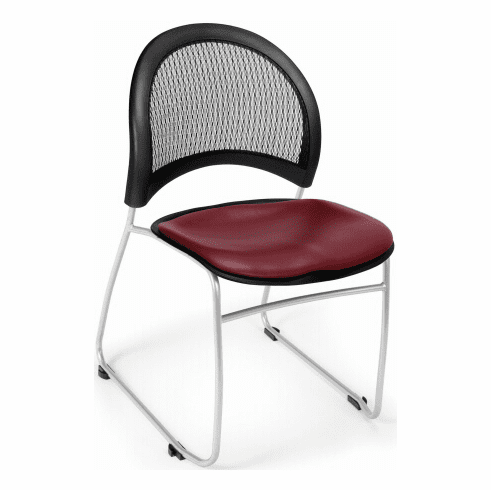 These vinyl stack chairs from OFM are a perfect fit for any guest or reception area, conference room, training room or break area. Features include a screen mesh backrest for maximum airflow and support, built in lumbar support curve, triple curve contoured seat pan, upholstered in durable easy care vinyl, tubular steel frame with powder coat finish, sled base for easier mobility over carpet, stackable up to (6) chairs high and your choice of (5) different vinyl colors. Meets or exceeds ANSI/BIFMA standards. Dimensions: Seat Size: 18.5"W x 17.5"D. Back Size: 19"W x 15.5"H. Seat Height: 18.25"H. Overall: 32"H x 20.75"W x 23.5"D. Weight: 13 lbs. ea. Limited lifetime warranty from OFM.